Fans of the Ghost Hunter series love the dust bunnies. As a result, I always get a lot of email asking me what dust bunnies actually look like. In the stories they are variously described as looking like "something that came out of the dryer lint tray" or that "rolled out from under the bed". They have fluffy gray fur. They also have four eyes -- their daylight baby-blues and a second, amber pair that they use for hunting. Dust bunnies are cute and they form psychic bonds with their human companions but they have a dark side that is pretty well summed up with the old saying: "By the time you see the teeth, it's too late". In spite of my astounding powers of description, I always get a lot of email from readers who want to know what a dust bunny looks like. I have been keeping an eye out for a small beast that closely resembles a dust bunny. 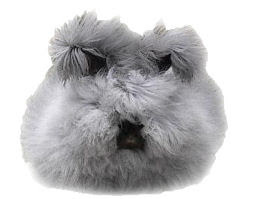 I am happy to report that Cissy (my glorious webmaster) and I have found an actual dust bunny, thanks to Betty Chu. So, for those of you who have always wondered what dust bunnies look like, here's your visual. Her name is Araminta. Vincent is played by Chu's Angelababy. Araminta is played by Chu's Melania. Elvis is played by Chu's Donovan.